Florida: Agriculture Commissioner goes also to recount. Last time I checked, this race was done and the difference was close but enough. All of the sudden we now have three seats in which the Democrats suddenly are popping votes from nowhere and closing the gaps to activate recounts. 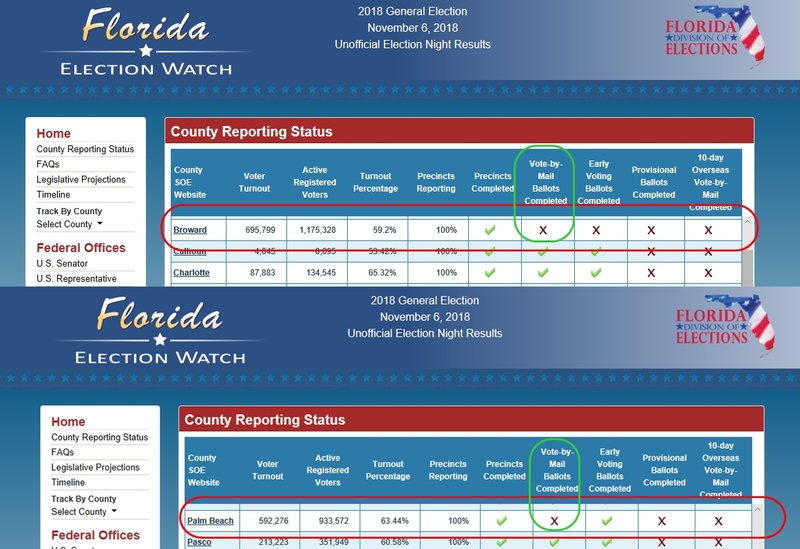 Here is the official Florida Elections Watch and here is a screen capture taken at 1:45 pm 11/8/2018. The only counties that have not finished the Mail-In ballots are Broward and Palm Beach. Ladies and Gentlemen, I do believe we are watching a coup in progress orchestrated from Broward County, Palm Beach county and its Democrats. Not happy that their politics killed 15 kids at Parkland, they are now aiming for the rest of the sate. We are about to lose Florida. Al Franken to the white courtesy phone please. Call the local GOP and volunteer. That’s why it’s so important to win past the margin of fraud. This is why I’m such a staunch advocate of making voting ONLY in person and with ID. The only absentee or mail in ballots should be for persons in the military or overseas state department. With blank ballots in the hands of corrupt officials, it does not matter how you vote: They will stuff the box. I worked “twelve hour” shifts. 7 am to 7 pm. In by 6 am to start the turnover process, and if stuff happened between 5 and 7 pm, sometimes couldn’t leave before we stabilized things and finished the important paperwork at 7:30 or 8 pm (and spent half the next shift finishing the unimportant paperwork). Luckily every Election Day I worked the night shift, and voted on the way home. My neighbor does field service work. He may get a call at midnight, and be gone for two days, two weeks or two months. Some people need the option of absentee ballots. The problem is the games people (Democrats) play with them. Except Florida has polling open for two weeks.